Bowing to the Left: Why the bipartisan applause for ‘more women in the workforce than ever before’? It was one of the few times he received a standing ovation from both Democrats and Republicans. Feminists deny this, claiming they don’t prefer women work outside the home; they only want women to have the choice to do so. 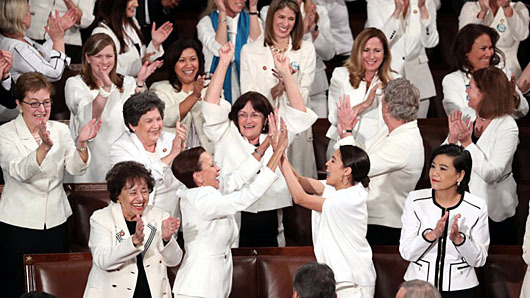 But if that were true, why did congressional Democrats — the women in white, feminists all — jump up and cheer? One reason bears testimony to the thesis of a recent column I wrote: The greatest fear in America is fear of the Left. A second reason bears testimony to another fact of contemporary life: Republicans have been far more influenced by leftism than Democrats have been by conservatism. While many of the Republicans who cheered did so out of fear of the Left and/or to support their party’s beleaguered president, many sincerely believe the record number of women in the workplace is something worth celebrating.